The high speed Hyperloop has people excited in all sorts of circles. Transportation buffs are excited about the opportunities to alleviate congestion in urban areas. Environmentalists are curious about the emissions savings potential. Designers are jumping at the chance to show off their interpretation of Hyperloop pod concepts in the contest Elon Musk and SpaceX have launched. Argo Design, designers of the Lane Splitter concept motorcycle/car hybrid, are among the first to throw their hat into the ring, releasing a detailed collection of drawings and renderings to represent their version, which includes four modular capsules riding on what they call a Hyperloop Sled. 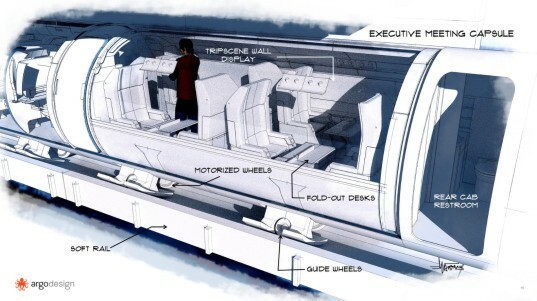 The entire Hyperloop system, in Argo Design’s concept, is comprised of four levels, much like an airport terminal. The high-speed tube will be designed to carry vehicles and cargo as well as human commuters, with separate areas for each. Three of the four capsules are designed for human passengers. 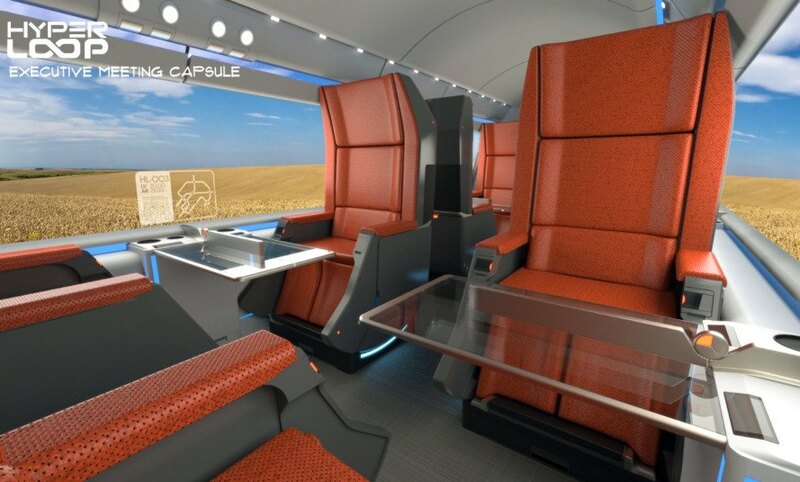 Riders can choose between the coach capsule, business work capsule, and a fancier eight-person executive meeting capsule, which is intended to be reserved for business meetings or anytime travelers want a posher, more private high-speed travel experience. The executive meeting capsule accommodates two four-person meetings, with seats facing one another over removable desk trays. Ideally, this will allow for business meetings to take place during a commute from one city to the next. The business work capsule is designed with the solo working commuter in mind. Each seat is a self-contained work station, where passengers can use a wireless keyboard and private wide screen monitor to work on whatever is most pressing. The coach capsule is not entirely unlike an airplane cabin, with rows of seats all facing the same direction, although with a great deal more leg and elbow room that most airlines offer these days. 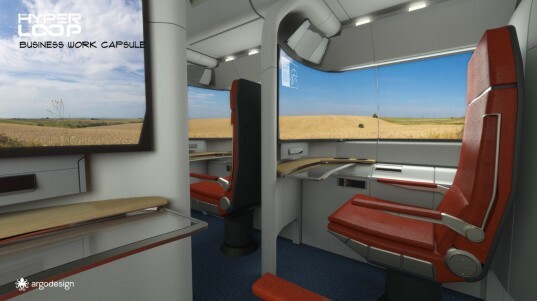 Because the design centers around trying to make people forget they are traveling at alarmingly high speeds, the designers have included digital wallpaper, called Tripscenes, to display any number of appealing scenes, since the capsules are essentially windowless tubes. Although the proposed Hyperloop has been touted as being capable of speeds in excess of 700mph, Argo Design has created a concept based on just 300 to 400mph to balance the risks of motion sickness. Since the slower speed means passengers would be on board a little longer, the design includes bathrooms and space for walking around. The Hyperloop test track is nowhere near ready to carry passengers, as the test track is still reportedly in the planning stages. Many are skeptical about whether a high-speed pod transport system like this is even possible, but time and Elon Musk will tell. The capsules are designed to be removable from the track by a giant "jukebox" arm. Three of the four capsules are designed for human passengers. Riders can choose between the coach capsule, business work capsule, and a fancier eight-person executive meeting capsule. The executive meeting capsule is intended to be reserved for business meetings or anytime travelers want a posher, more private high-speed travel experience. The executive meeting capsule accommodates two four-person meetings, with seats facing one another over removable desk trays. Ideally, this will allow for business meetings to take place during a commute from one city to the next. The business work capsule is designed with the solo working commuter in mind. Each seat is a self-contained work station, where passengers can use a wireless keyboard and private wide screen monitor to work on whatever is most pressing. Each station could be used for work or for fun. The design attempts to make the most of space inside the capsule as well. The coach capsule is not entirely unlike an airplane cabin, with rows of seats all facing the same direction, although with a great deal more leg and elbow room that most airlines offer these days. All of the seats face the same direction in the coach capsule. Because the design centers around trying to make people forget they are traveling at alarmingly high speeds, the designers have included digital wallpaper, called Tripscenes, to display any number of appealing scenes such as prairie views or outerspace. Although the proposed Hyperloop has been touted as being capable of speeds in excess of 700mph, Argo Design has created a concept based on just 300 to 400mph to balance the risks of motion sickness. Since the slower speed means passengers would be on board a little longer, the design includes bathrooms and space for walking around. The design is open and airy, with lots of room for individual passengers. The Hyperloop test track is nowhere near ready to carry passengers, as the test track is still reportedly in the planning stages. Many are skeptical about whether a high-speed pod transport system like this is even possible, but time and Elon Musk will tell.